So what is 4phase going to be exactly? Well, a kind of round table group or workshop with a (literal) round table in four colours, and a clock in four colours, so we go through the four phases in turn in whatever we are talking about (the topic for the week, perhaps. Possible ones are Finding your life purpose; getting on with difficult spouse/co-worker/child; monetising your passion; overcoming fears shyness, etc….). Hopefully it will be an amazingly safe and inclusive yet creative and challenging environment for co-creation, problem-solving, and fellowship. So, if you have read this far, please do click on ‘follow this blog’ in the sidebar, and you will get email notifications, with the first few words, whenever I publish a new post (not that often I promise!). 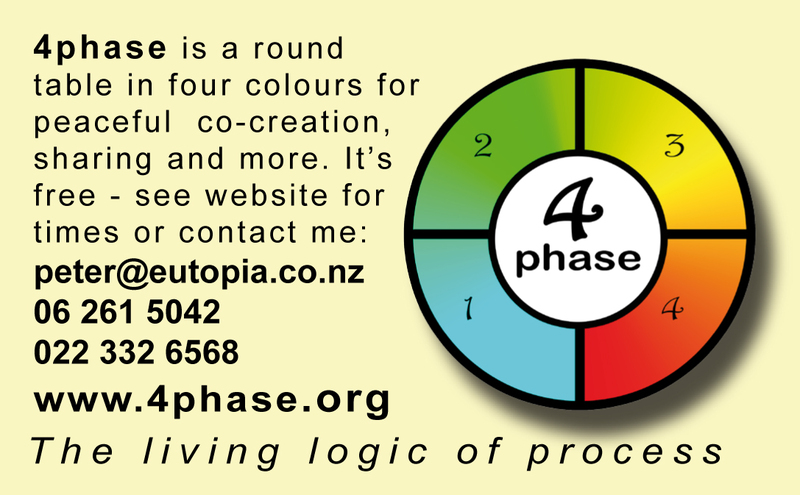 And if you happen to live in Gisborne, NZ, then consider coming to our place and trying our the 4phase round table with me. It’s free. You will be being a guineapig in the early days of this, but I guarantee it will be helpful, maybe even life-changing! And you will get the opportunity to be an early adopter in a genuinely ‘new new thing’! For those of you who aren’t lucky 🙂 enough to live in Gisborne, I hope to offer some cool materials and free web resources soon. There are already some on http://www.qor.co.nz – a free game to print out and try, etc. And if you want the hardware – 4phase round table, 4phase blackboard, 4phase clock, and diary and worksheet to come.. email me. Later there may be a proper ‘store’ but this is NZ, and the ‘personal touch’, so-called, is OK by me and hopefully you too! Watch this space… oh and if you have any comments, thoughts, reactions, offers, comment in FB or here or email me, or even visit in 3D!